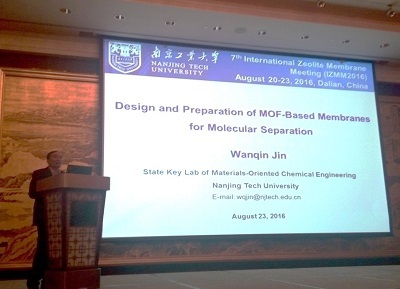 Prof. Jin attended the 7th International Zeolite Membrane Meeting (IZMM2016) during August 20-23 in Dalian. He was invited to give a Keynote lecture of “Design and Preparation of MOF-based Membranes for Molecular Separation”. On August 23, Prof. Jin was invited to attend Dalian Institute of Chemical Physics (DICP) Symposium on inorganic membranes, giving a lecture of “Design and Preparation of dense oxygen-permeable conducting membranes”.